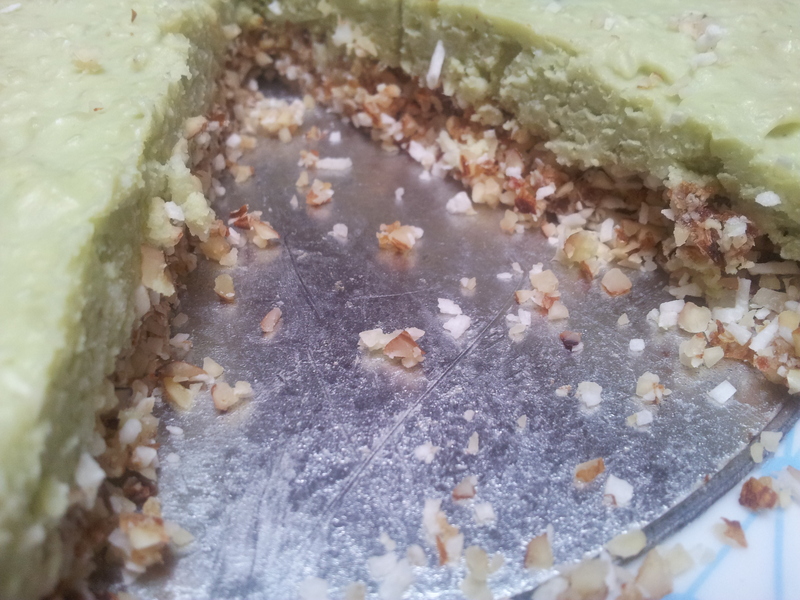 This is a raw and frozen tart that is delicious and flavoursome. 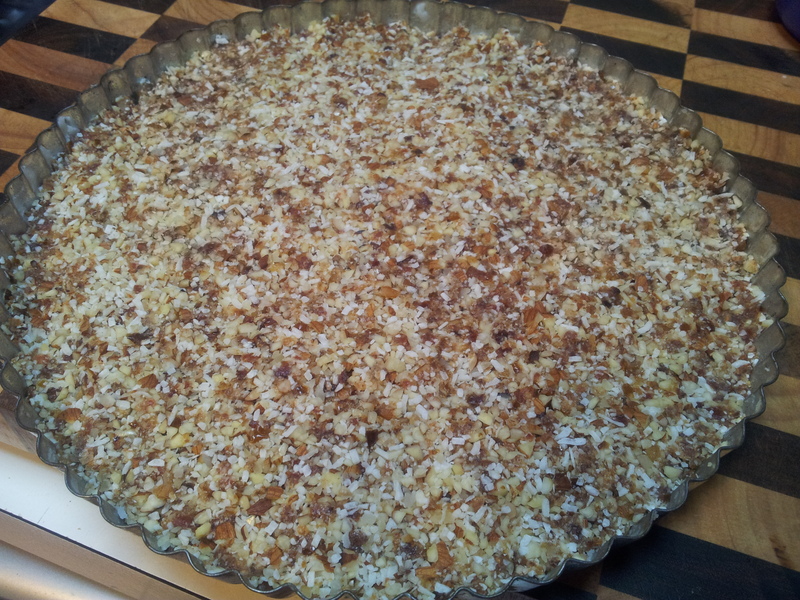 The smooth top layer blends well with the rustic coconutty base. 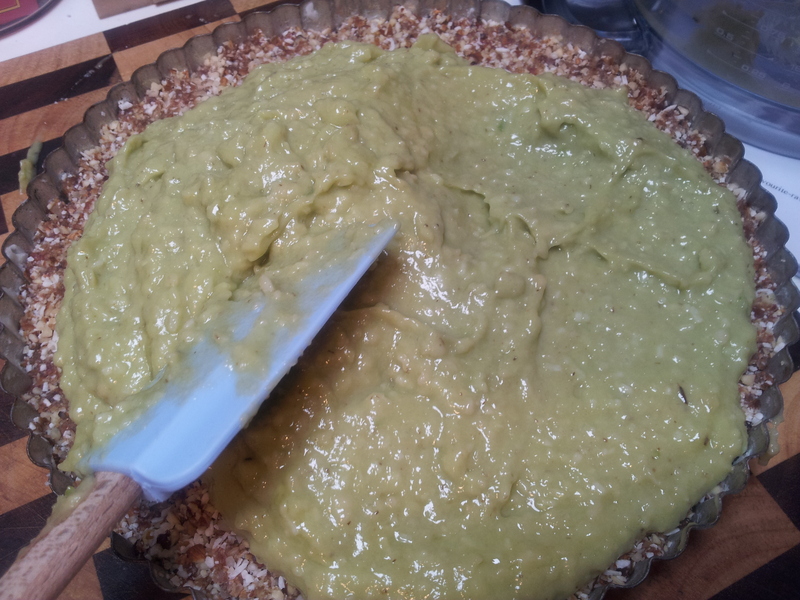 There are 2 stages to this tart which are making the base and the top layer. The process is very quick and it sets in the freezer in a couple of hours. 1 cup of nuts (I used raw activated almonds-your choice). 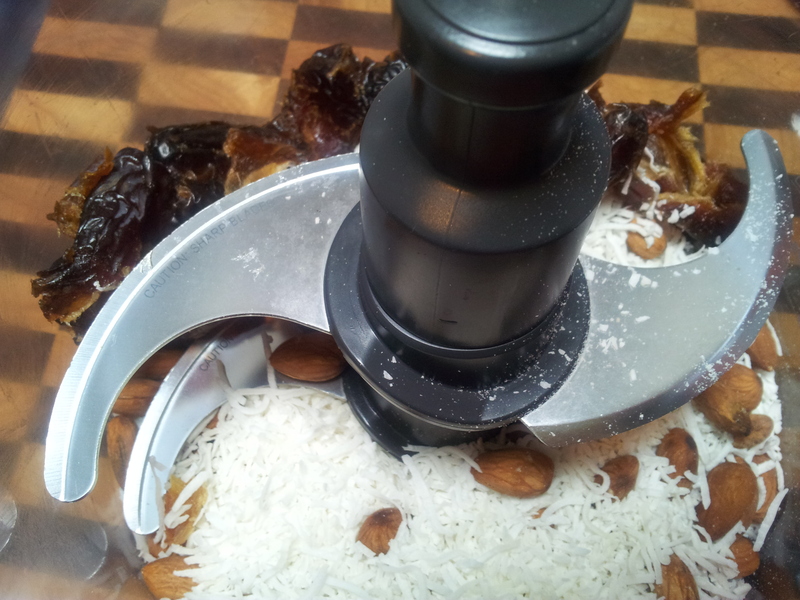 If you want a smoother less rustic base you could use blanched almond meal. I like the base crumbly. Place all of the base ingredients in the food processor and whiz until well combined and broken down. The base ingredients ready to be processed. Have a pan greased and ready. I used one where the edge is serrated and the base comes out. 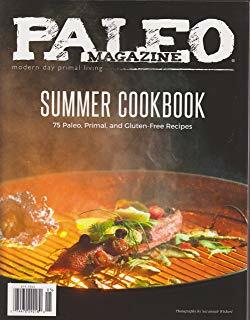 Grease this well with coconut oil. 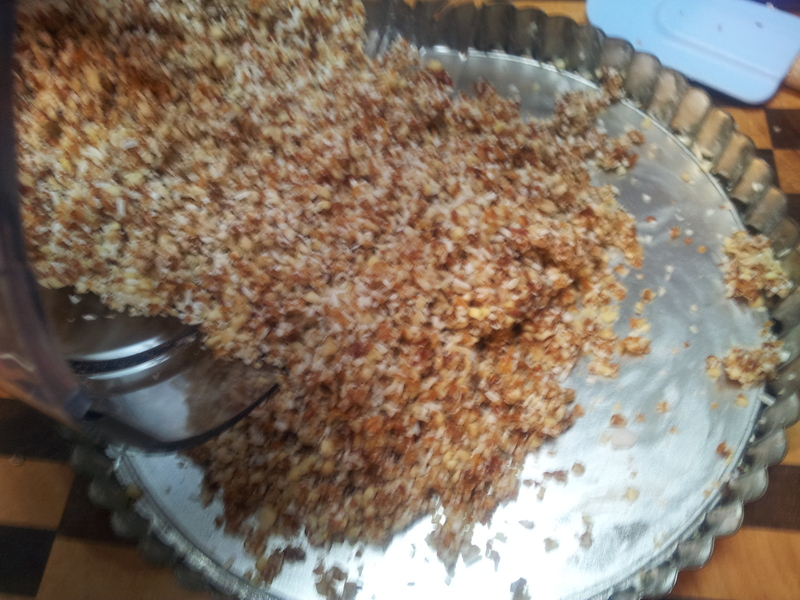 Place the processed mixture into the pan and push down well with a spatula and then your fingers. It should be even and well compressed. Pouring the base mix into the greased pan. The base is nice and flat and will make a good base for the tart. Carefully place the tart in the freezer for about 30 minutes to firm up. If you use the pan l did hold the base with your hand while you do this. 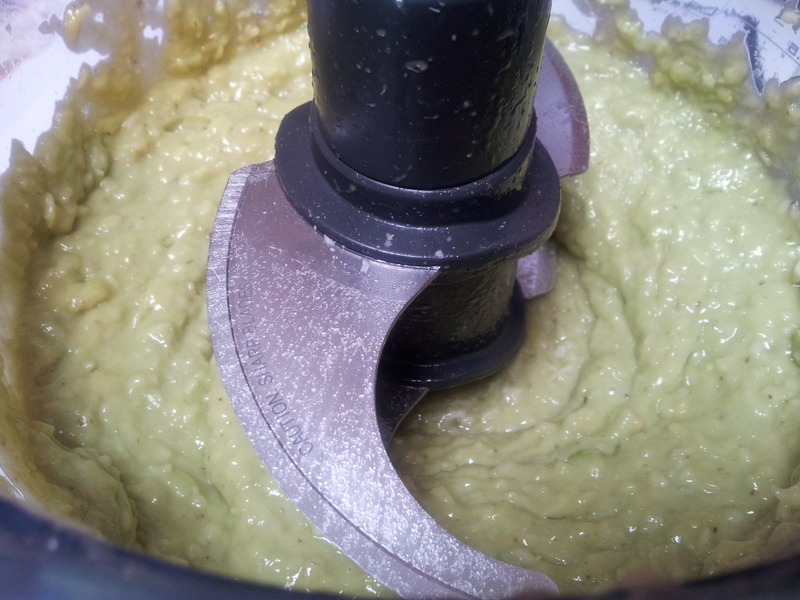 Place all of the ingredients in the food processor and whiz until smooth. Taste test to check the flavour. It should have a nice zesty lime flavour. 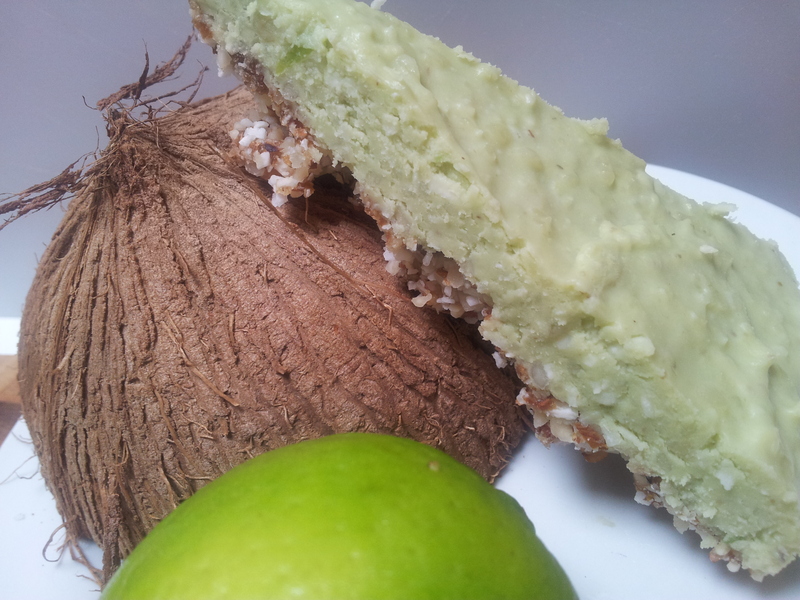 Pour the lime mixture onto the frozen base and spread out evenly using a spatula. Spread the mixture right to the edges. 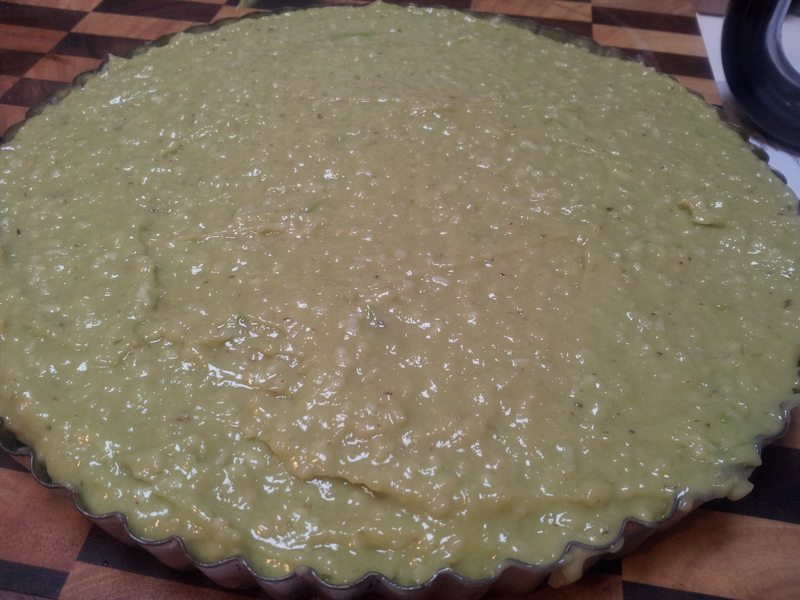 When it is even place the tart gently in the freezer for a couple of hours. Lift gently onto a flat surface in the freezer. Use a clean sharp knife to carefully cut the tart. Lift it onto the plate using a cake server. Serve by itself, with some fresh fruit or a topping of raw organic dark chocolate finely sliced. A frozen treat that you can keep in the freezer to use as needed. This is a really lovely recipe and could be kept well covered in the freezer to use as required. You can follow me daily on Instagram at holistic_paleo or Facebook at Holistic Wellness for Life. I am also on Pinterest, Twitter, Flickr and Tumblr. For all your pantry needs. Located on the Mornington Peninsula in Melbourne. For all of your favourite books at great prices.